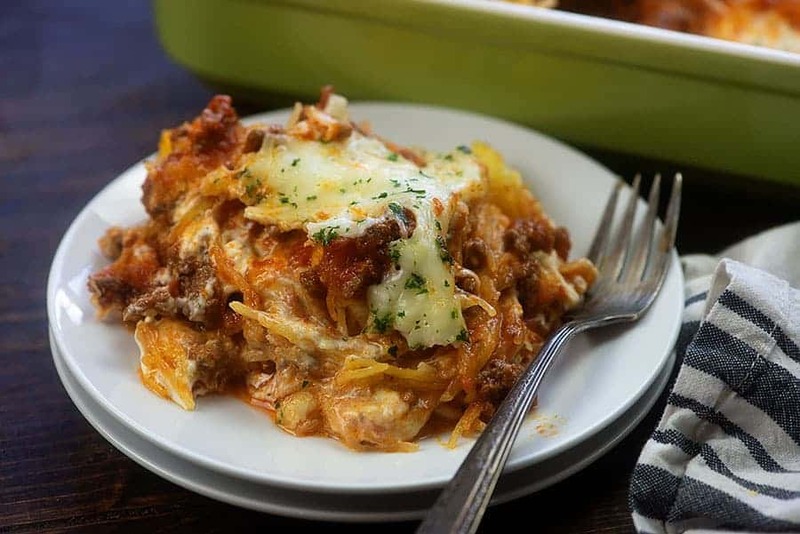 Million Dollar Spaghetti Casserole without all the carbs!! 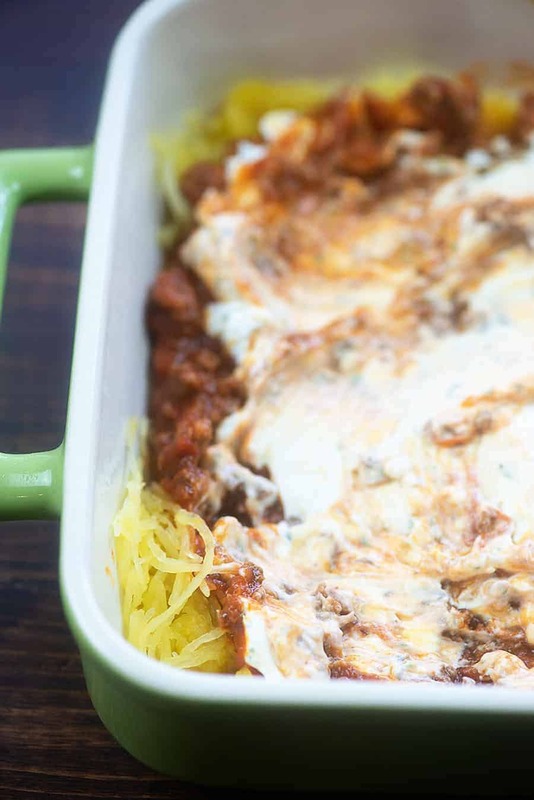 This spaghetti squash casserole is a riff on one of my favorite pasta recipes and it is totally family friendly, packed with cheesy goodness, loaded with flavor, and keto friendly! 8 net carbs serving. One of the things I love most about this time of year is the whole comfort food situation. People don’t seem to like casseroles in the dead of summer, but they are 100% totally acceptable the minute it starts to cool off. 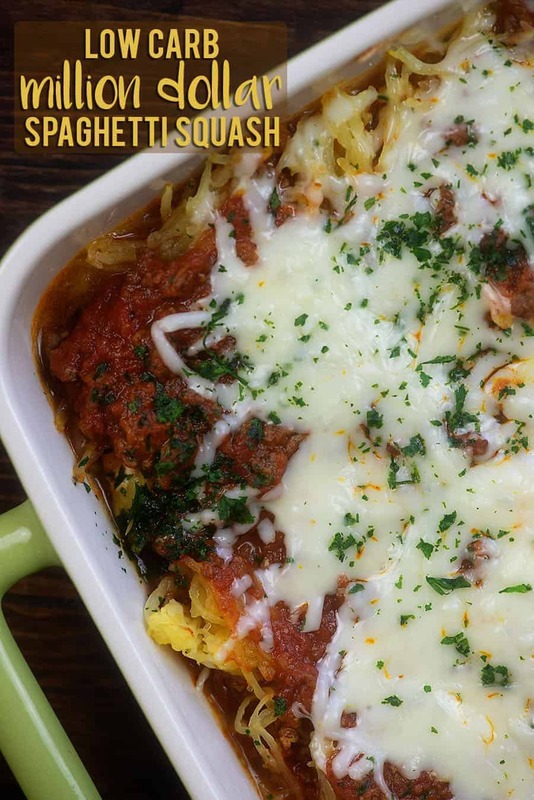 Sure, I miss the sunshine and my pool, but did you take a close look at this cheesy spaghetti squash casserole? Doesn’t it look dreamy? One of my favorite pasta recipes is million dollar spaghetti so I took the idea and swapped out spaghetti squash for traditional pasta. 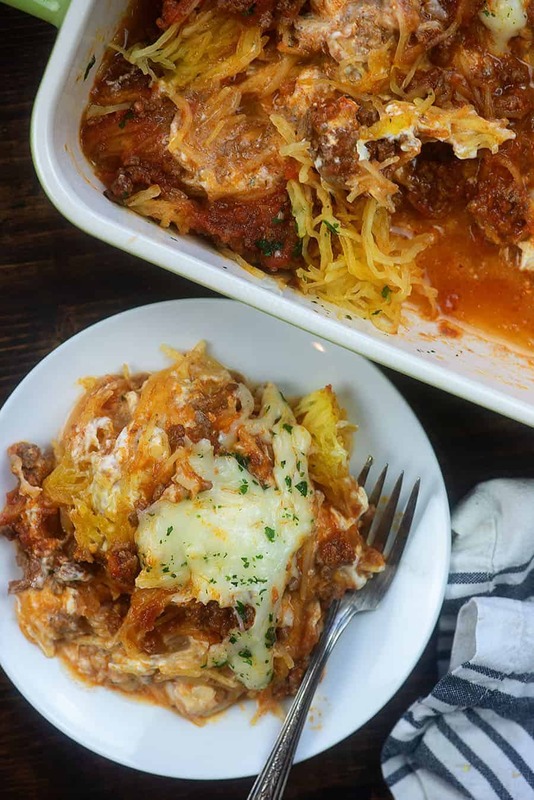 This is probably one of the best spaghetti squash recipes I’ve made yet! To start, you’re going to cut a spaghetti squash in half. 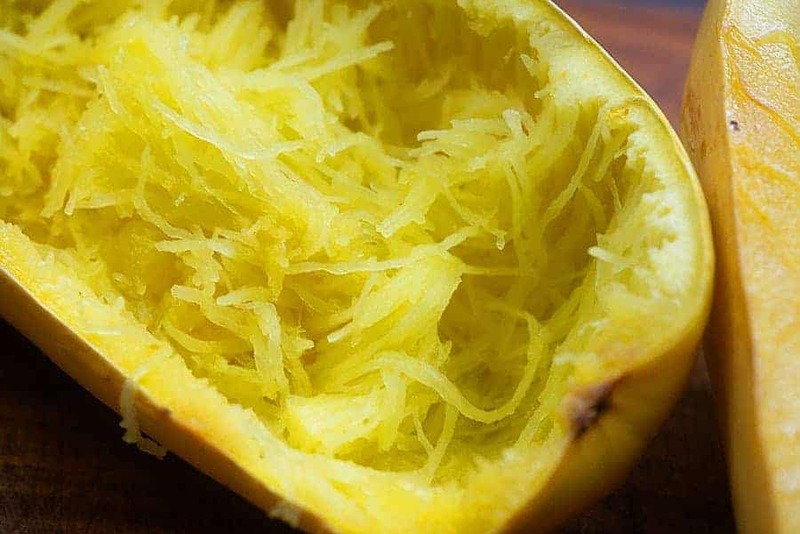 This probably sounds like an easy task, but if you’ve ever worked with spaghetti squash before you’ll know that you need to bring your muscles and a sharp knife to this game. Now, scoop out the seeds, drizzle some olive oil on the inside of the squash and place it flesh side down on a rimmed baking sheet. Roast it for about an hour. When the squash is cool enough to handle, use a fork to scrape long strands of squash out. 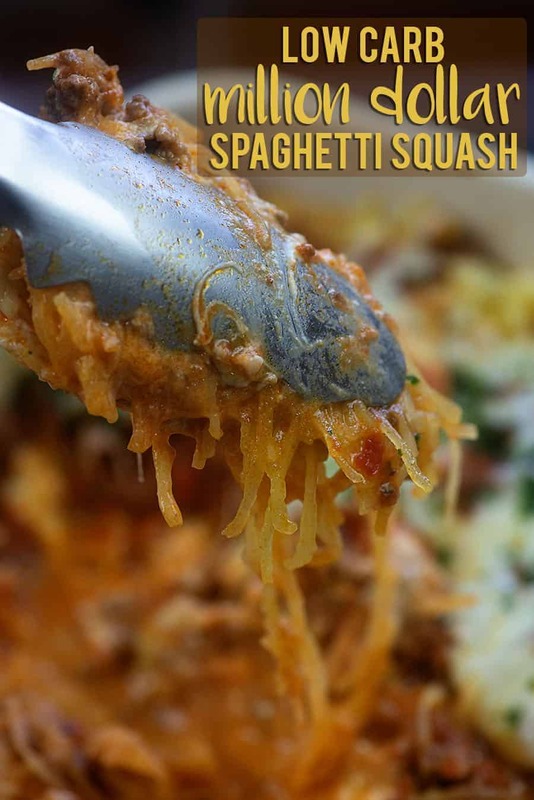 If you go lengthwise down the squash you’ll get short strands of spaghetti. If you go across the width of the squash, you’ll get long strands. It’s kind of counter-intuitive, but just play with it. It all tastes the same either way. Brown up your ground beef and then dump in your favorite low carb marina. I prefer Rao’s and use it almost exclusively. There are only 4g net carbs per 1/2 cup serving. You can find it at most any grocery store, usually up on the top shelf. It’s a little pricey, but it’s seriously the best! 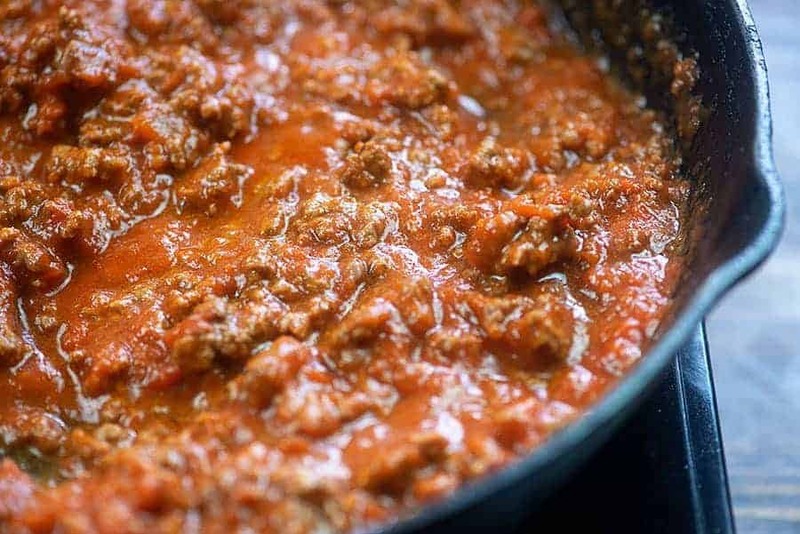 Let your meat sauce simmer away while you get to work on the million dollar aspect of this recipe: dairy goodness! 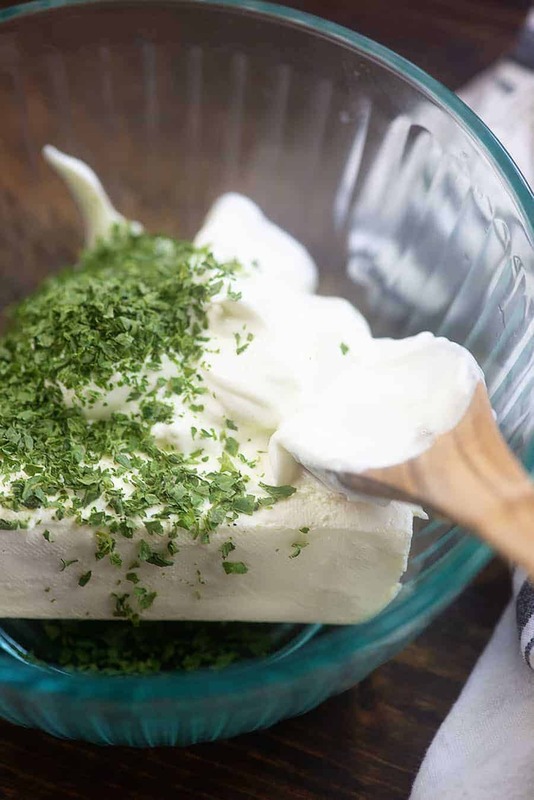 Add some cream cheese, sour cream, and fresh parsley to a small bowl and stir until well combined. This mixture is so creamy and amazing. The traditional million dollar spaghetti calls for cottage cheese as well, but it adds a fair amount of carbs so I skipped it. If you have room in your carb allowance, go ahead and add a 1/2 cup of cottage cheese to this mixture. You won’t regret it! 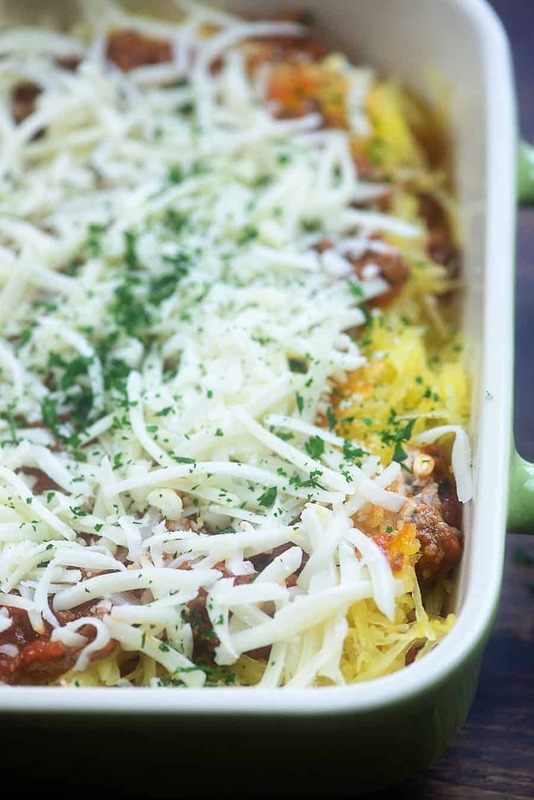 Add half of the spaghetti squash noodles to the bottom of a 9×13 baking dish. Top that off with half of the meat sauce and then spread on all of the cream cheese mixture. Next, add the final layers of spaghetti squash and meat sauce and top that all off with some grated mozzarella and a little parsley. Pop this in a hot oven for 20 minutes to allow the cheese to get all warm and melty. I like to serve this with a big side salad topped with my homemade ranch dressing. Low Carb Chicken Casserole: Made with cauliflower rice, broccoli, and chicken! Zucchini Pizza Boats: Pepperoni on mine please, but you can add any of your favorite toppings! Buffalo Chicken Meatballs: We eat these for dinner, but they’re fun for game day too! Cabbage Rolls Recipe: None of the work, all of the flavor! Made this today. Not enough squash for the sauce. But delicious. I love spaghetti squash. Made this recipe last night almost as written. The only changes were 1 1/2 pound of ground beef and 4 pounds of squash. I used Rao’s marinara sauce. There was a small inconsequential amount of water in the bottom of the 9X13 dish but I feel it just meant there was going to be adequate moisture in the casserole. It was a hit with the family! Even a picky eater loved it! Making it again today as last nights is gone and they are asking for more!! My wife rated it 10+ stars and said I could make it anytime!! Trying it with a less expensive sauce this time. This is delicious. I changed it a luttle. I cook the spaghetti squash whole 8nstead of struggling to half it. I take out the seeds & roast them in salt & olive oil for a snack. I sauteed mushrooms, zucchini & winter squash & added mixture to meat & sauce. 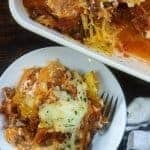 Love love this recipe.. I’ve made it twice in two weeks..I work 12 hours shifts and this is a great dish to prepare ahead of time and warm up for work. I used the spicy Rao’s sauce and it was delicious !!! We all loved it, thanks for sharing !! This turned out so good!! I seasoned the meat with garlic, onion powder, crushed red pepper, Italian seasoning, salt and pepper! The cream cheese and sour cream combo goes so well with meat and squash! We loved this recipe! Not sure if anyone else made same comment – you can poke holes in squash wit a fork, all over, & microwave whole. Put in for 7-8 min, turn over, same another 7-8 min. Cut in half lengthwise, remove seeds & what u dont want, then scrape out what u do want. Proceed. Really shortens up the process & works great. My casserole is in the oven right now! Just ate it…. very good, thank u for sharing it! Made this weekend! Ridiculously yummy! If I could give more stars I would! Just me and my hubby, we have been eating as leftovers and shockingly enough, even I am ok with that. I usually can eat spaghetti once then I am good for months. Not this, I can’t wait to make it again! I think there is something about the squash and cream cheese/ sour cream mix that tones down the acidity to a very tolerable level for me. Thank you for this million dollar find! I’ve never tried freezing it before – my only concern would be the squash releasing a lot of liquid…might be a bit more wet. I could not believe how this recipe turned out! Its absolutely amazing!!!! I’ve never had anything like this!!! I Love This website there are so many recipes i love!!! I printed off so many recipes i have to buy a binder for them! Thank you for sharing Karly Campbell!!!!!! This is a huge help to my diet and its now a life style with these amazing recipes!!! I’m losing weight and i’m a lot healthier now to! I feel great!!! !